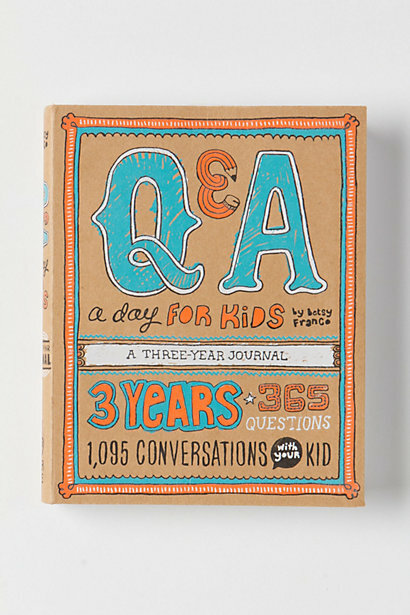 As you may recall, in 2012 my mom got me this book Q&A a Day for Kids. I failed miserably at keeping up, as I do with all things in my life that are “extras.” We made it through April in 365 days… but I’m not letting that stop me. I’ll keep going not paying attention to the dates and write down their silly answers. Some may be a year apart, and some may be three. Does anyone care? I didn’t think so. 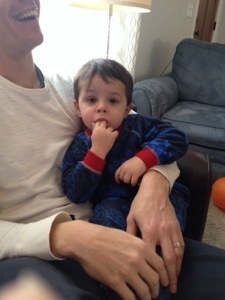 Alex, now 4, has picked up some new themes – as you may recall, he was obsessed with Target at the beginning on 2013. But due to a relocation of the store further from our home (BOOOO!! ), Target has exited the brain and has been replaced with wrestling. Q: What sounds do you hear around you? A (Joseph): Daddy cleaning some grease off, Alex eating, and Mommy writing. A (Alex): Bats and tigers. Q: What are you thankful for today? A (Joseph): I’m thankful for Jesus. A (Alex): I’m thankful I can hope. Q: What is your favorite thing in nature? A (Joseph): Grass because it’s really soft. A (Alex): Going in a tunnel. Q: What do you really like about yourself today? A (Joseph): I like that I gave the tattoos to my friends. A (Alex): I like to play wrestle. Q: What did you do this week to keep your body strong and healthy? A (Joseph): Eat lots of food – fruit and vegetables. Q: When were you brave? A (Joseph): When I heard lots of noises in my room and I slept still…and when Santa was here. 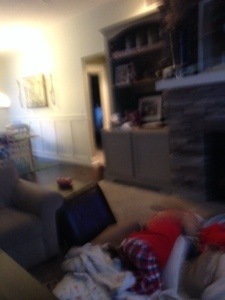 A (Alex): When Santa came here and I played wrestle with him. Q: Describe what your Dad does for his job. A (Alex): He works with tools. Q: What advice do you have about keeping friends? A (Joseph): Say thank you for the stuff that they do, give ’em a pound and give ’em a high five. A (Alex): Play ring around the rosie. Q: Which one of your senses is your favorite? Why? A (Joseph): Tasting. I like to taste candy. A (Alex): Smell. I like to smell things and then see them. Q: What is the best thing about your life right now? A (Joseph): Oh that’s easy! Having friends and having family. A (Alex): Playing with Leo. Q: What do you wish you had more time for these days? A (Joseph): More time for being outside. A (Alex): Taking somebody’s beyblades. Q: If you ruled the world, what would you change? A (Joseph): I would not have people go in time out and I would just take away stuff – like books. A (Alex): My bathing suit and my underwear. Q: What is your favorite way to get around? A (Joseph): Ride my bike or my scooter. A (Alex): I like to go through the woods. Q: Who is the oldest person you know? A (Joseph): Grandpa Peters and Munga. Q: If you could have any superpower, what would it be? Why? A (Joseph): Really fast at Legos because I want to get really good at them. A (Alex): GRRR! And running. Because I like it. Q: If _______, things would be a lot better. Q: What have you done lately to help the planet? Q: I hate it when ________. A (Joseph): somebody chews on my toys, or takes my toys. A (Alex): somebody takes my toys away or takes my family to jail. Q: Whom do you look up to? Why? A (Joseph): God, because he’s in my heart. A (Alex): Morgan, because I like her. It’s January 6th. The supposed first day back to school after winter break. Only today we’re at home again. For the 18th day in a row; but who’s counting? Snow days like this – emergency snow days – call for deep reaches into the patience bucket and high doses of tolerance. Throughout today’s adventures I’ve learned something: as long as I’m standing in the room where the action is, just watching, things go very well. As soon as I walk out, it all falls apart. Not much getting done that way, but my sanity is more important than chores today. 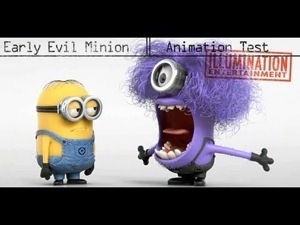 I feel like a purple minion – about to explode at any minute. So here’s how we’re surviving 30 billion inches of snow that we’re not allowed to play in due to 100 below wind chills. First, we find every pillow and blanket in the house and make “a pile” and then jump off the furniture into said “pile.” At 8am. This sweet action shot was taken by Alex of Joseph. Not exactly blog worthy, but whatever, you get the point. The infamous pile gets moved into many rooms throughout the house so we can try out various dismounts from differing heights. 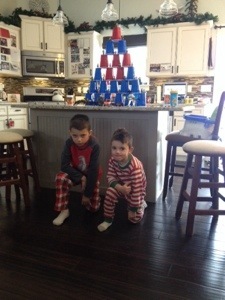 Next, we pull out the solo cups and build towers. This entertained them for a good 45 minutes and then finding every Lego guy we own to put on each piece of the tower swallowed up another 20-30 minutes. Brilliant. After the tower fell, I diffused the anger and disappointment with another project! 2 words that solve any problem: rocket launcher. 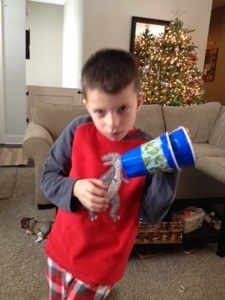 We made rocket launchers out of the solo cups. Pinterest is a beautiful thing. There was a little of this in there, too. And now it’s nap time so we’re eating popcorn and watching Disney junior. 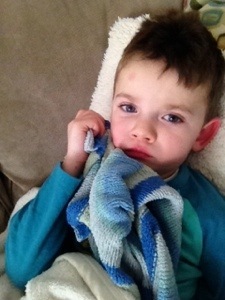 (Oh yeah, that bruise on his forehead is from an unsuccessful pile jump. Oh well).